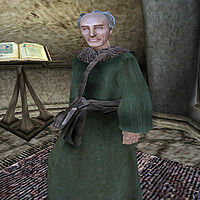 Codus Callonus is an Imperial bookseller in Ald'ruhn. While he is not directly involved in any quests, you may be directed to his shop in order to look for certain rare books. If you ask him during the Courtesy quest for the Imperial Legion, he will give you a free copy of The Red Book of Riddles. He will also donate 10-20 gold to the Imperial Cult for Buckmoth Alms, if his disposition to you is high enough. Codus Callonus is a veteran of the Imperial Legion and an author. He wrote Mixed Unit Tactics v1 based on his experience in Elsweyr, while serving at the Sphinxmoth Legion Fort. He wears a common robe with matching shoes. He carries his key to a chest located in his store. Aside from his natural charm and ability to absorb fatigue from others, he knows the spells Telekinesis, Soul Trap, Divine Intervention, Almalexia's Grace, and Almsivi Intervention. "Ethes Evos was studying that book in the hopes of passing the Imperial Exams and moving to Cyrodiil. Perhaps he could make you a copy." "He's one of my best customers and a good friend. He's the seneschal of Arobar Manor." "Yes. The Ashlander trader. A bibliophile. Likes poetry. I have a few such volumes here, I believe. 'Words of the Wind.' 'Ashland Hymns.' 'The Five Far Stars." Around here somewhere." "Yes, I have a copy... Why do you ask?" Nevermind. : "Well, then, would you like to buy something?" "I already gave you my copy. Use it well." "I heard how easily you beat Salyn Sarethi. I'll be sure and mention that the next time I hear a Buoyant Armiger insulting the Legions." "I heard about your duel with Salyn Sarethi. Don't be ashamed. The Buoyant Armigers are going to accuse the Legions of all sorts of things no matter what we do." If the Entertainers official plugin is installed, Codus will have copies of two of the new books added: The Balladeer's Fakebook and The Battle of Molag Beran. This page was last modified on 23 November 2018, at 06:01.